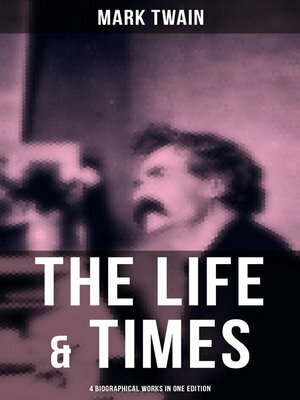 Mark Twain began writing his autobiography long before the 1906 publications of these Chapters from my Autobiography. He originally planned to have his memoirs published only after his death but realized, once he'd passed his 70th year, that a lot of the material might be OK to publish before his departure. These chapters were published in serial form in the North American Review during 1906-1907. While much of the material consists of stories about the people, places and incidents of his long life, there're also several sections from his daughter. In My Mark Twain, Howells pens a literary memoir that includes such fascinating scenes as their meetings with former president Ulysses Grant who was then writing the classic autobiography that Twain would underwrite in the largest publishing deal until that time. But it is also notable for its affectionate descriptions of his friend's family life during Howell's many visits to the Twain residences in Hartford and Stormfield. Mark Twain A Biography and The Boys' Life Of Mark Twain written by Albert Bigelow Paine, are an invaluable resource to better understand Twain, the stories behind his stories and his life with those he loved and with whom he worked. Mark Twain (pseudonym of Samuel Langhorne Clemens) (1835-1910), quintessential American humorist, lecturer, essayist, and author wrote The Adventures of Tom Sawyer. William Dean Howells (1837-1920) was an American realist author and literary critic.